Deuter Kid Comfort 2 Cranberry Fire Kid Carrier with Sun Roof and Rain Shield by Deuter at Baby Bouncers & Swings. MPN: LYSB06XY9RH8C-SPRTSEQIP. Hurry! Limited time offer. Offer valid only while supplies last. Microrip-Nylon/Super-Polytex Deuter Kid Comfort 2 is an ergonomically designed child carrier well suited for heavy loads and longer travel. Microrip-Nylon/Super-Polytex Deuter Kid Comfort 2 is an ergonomically designed child carrier well suited for heavy loads and longer travel. Anatomically shaped shoulder straps, lightweight aluminum frame, concave and ultra padded hip belts make this hiking backpack comfortable, stable, and easy to use, with perfect load control. Specifications: weight: 7 lbs 3oz; size: 28/17/13 (H x W x D) inches; volume: 16 Liter Height adjustable seat offers smart support and accommodates both baby and toddlers. 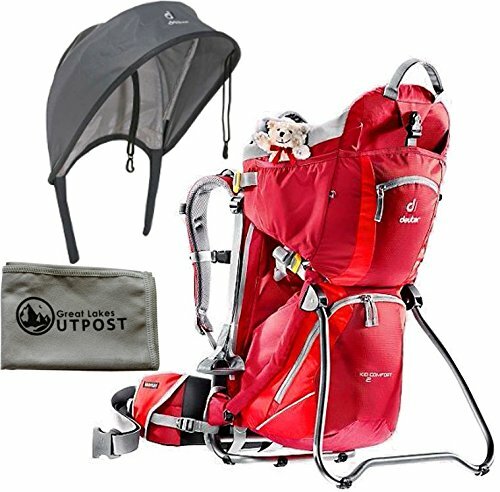 Children of different ages, heights, and weights can easily be transported in this hiking pack. Height adjustments can quickly be done even while the child is all ready seated in the carrier. Integrated kick stand creates a stable platform for the child carrier to be placed on the ground with a baby or child seated in place. A framed backpack carrier designed to comfortably fit both Moms and Dads. Ergonomically designed child carrier well suited for heavy loads and longer travel. Anatomically shaped shoulder straps, lightweight aluminum frame, concave and ultra padded hip belts make this hiking backpack comfortable, stable, and easy to use, with perfect load control.